All humidifiers need a replacement filter at regular intervals. Even if your model isn't from one of the more well-known manufacturers, it still deserves to be treated well so that in turn it'll be good to you too. That's why here at Best Humidifier we've created this page for replacement filters for the general lesser-known makes. If you've got a model made by one of the bigger manufacturers, we cater for you too. Just check out the hyperlinks at the bottom of this page for individual pages which specifically feature filters only for specific brands, making it easy for you to find exactly the filter that you need for your own particular machine. <b>Dimension: </b> 7.5 H x eight W x three and a half L in. 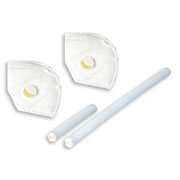 Includes two masks and two tubes for use with The Wearable HEPA Filter. Fits GE humidifier models 106609 106663 and 106763.
strengthened design for improved lifetime and better efficiency. traps impurities in the water. Specifically made for use with your humidifier. Ffits lasko 1128 1129 (thf8). Item weight - 0.4 pounds. Filters last up to four months. Fits Evenflo humidifier models 655000 and 655001. Natural Cool Moisture replacement humidifier filter. Fits Models HCM-890 Duracraft DH-890 and DH-888. extracts Minerals and Pollutants From Water. <b>Dimension: </b> 8.8 H x 7.5 W x two L in. Fits Natural Cool Moisture<sup>TM</sup> Humidifier models DH799 DH800 DH801 DH812 DH840 DH840C DA1005 (AC-801) and DH7800. Fits Evenflo humidifier models 755 755000 755001 758100 and 759200. 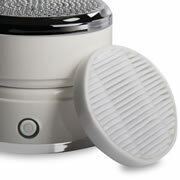 Humidifiers assist to decrease symptoms of cold and flu during the winter by releasing lost moisture back into the air. The humidity released back into the air can assist prevent dry nasal passages improve skin dryness and decrease static electricity. White Westinghouse humidifiers can also be beneficial to wood floors and furniture in winter cracking can occur. This White Westinghouse features honeycomb filtration to trap mineral pollutants found in water and assist prevent them from entering your home. For the best results change your air filter at least every 45 days or more frequently depending on air quality and use. Fits White Westinghouse humidifier models WWHM1285 WWHM1230 WWHM1290 WWHM1600 and WWHM1700ZE. Measures approximately four H x four 1/2 ID x 6 1/2 OD x one in. Thick. Turn off power and disconnect power plug. Remove old filter from unit and discard. Install new filter and replace back into the humidifier. Replace top fan assembly and reconnect power cord. For optimum performance replace filter twice a season or more frequently in hard water areas. <b>Dimension: </b> 8.8 H x 8.3 W x three L in. Fits Duracraft Natural Cool Moisture<sup>TM</sup> Humidifier models DH799 DH800 DH801 DH812 DH840 DH840C DA1005 (AC-801) and DH7800. Fits lasko humidifier model - 1115. Item weight - 0.25 pounds. Fits HALLS H620 HLS1300-U and HLS1400-U humidifiers. Fits North pole Stream humidifier model DA1005. Measures approximately 7 0.5 x 7 0.75 x one in. Fits Gerry humidifier model 650. Filters Water and eradicates White Dust. Your White Westinghouse humidifier can assist to decrease symptoms of cold and flu. The humidity released back into the air can assist prevent dry nasal passages improve skin dryness and decrease static electricity. Humidifiers can also benefit wood floors and furniture in winter when cracking can occur. Changing the filter is the key to keeping your unit benefiting your family. This White Westinghouse features honeycomb filtration to trap mineral pollutants found in water and assist prevent them from entering your home. For best results change air filter at least every 45 days or more frequently depending on air quality and use. Fits White Westinghouse models WST7501ZE and WST7505. Measures approximately five H x four 1/4 ID x 6 1/2 OD x one in. Thick. Humidifiers are essential appliances during the dry winter months. Your White Westinghouse Cool Moisture unit is great at releasing lost humidity back into your air. Moist air keeps your skin allergies and wooden furniture from being to dry and uncomfy. changing the filter is key to keeping this process running smoothly. This filter fits White-Westinghouse Natural Cool Moisture TM Humidifier model WWH8002 and has an antimicrobial agent with a patented rigid support that offers a long lasting design. Fits White-Westinghouse Natural Moisture humidifier model WWH8002. Measures approximately eight x 9.25 x 1.75 in. Fits humidifier models 1205 1211 2412 HD500 HD6200 HD7002 HD70020 HD70021 and HD7005. Fits eight hundred series whole house humidifiers. Dimension - 2.5 x three x three and a half in. Item Weight - 0.9 pounds.